Toothpaste, deodorant and a loaded handgun? Guns & America's analysis of TSA data found agents are finding more and more guns in carry-on bags. Last year, more than 771 million people passed through airport security nationwide. Among the liquids and wrapped presents Transportation Security Administration agents unearth in passengers’ carry-ons, they’re finding more and more firearms. From 2015 to 2017, the TSA found at least 9,866 firearms in carry-on baggage at airports nationwide. 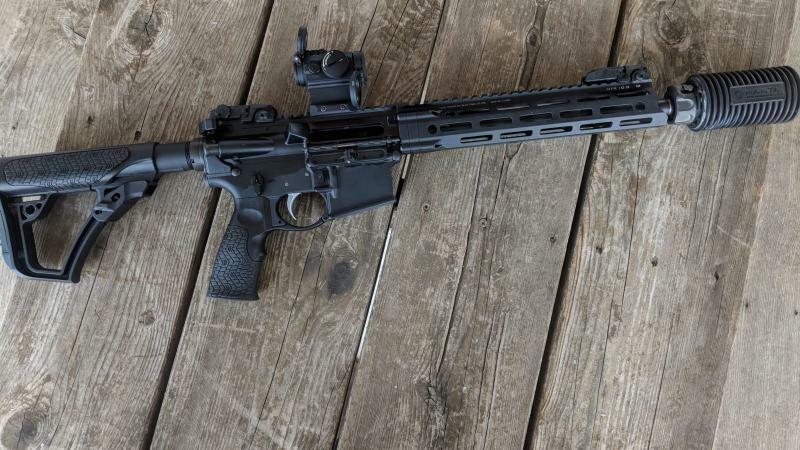 Unlike laptops or liquids under three ounces, firearms are listed on TSA’s prohibited items list, meaning like aerosol containers and lighters, they’re not allowed in the cabin, and can only be packed in a checked bag. According to Guns & America’s analysis of data released by TSA, the number of guns found at airport security checkpoints has grown. The TSA found 3,896 guns at airports across the country in 2017 — 49 percent more guns than the 2,608 guns found in 2015. More than 85 percent of these guns were loaded and more than 3 in 10 firearms found were “round-chambered” and ready to shoot. Carrying a gun through a TSA checkpoint is illegal. But due to the growth in state-issued concealed carry permits, many jurisdictions let permit-holders carry loaded firearms on their person or in a bag. 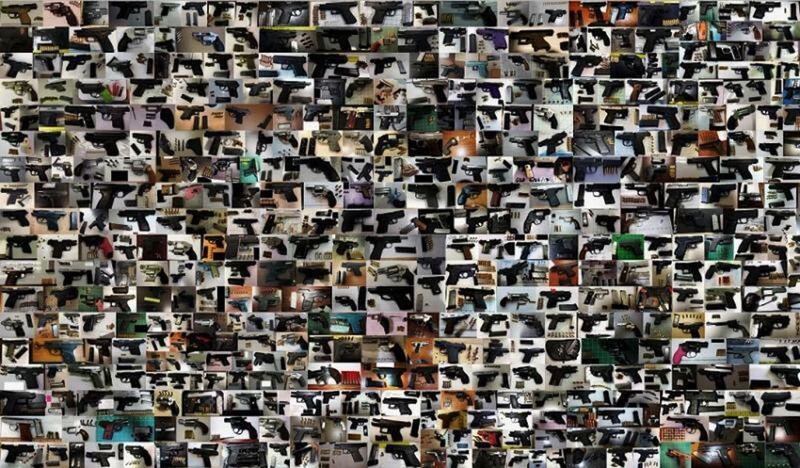 The collage above includes images of the guns TSA found in carry-on bags across the country in 2017. According to the Crime Prevention Research Center, a conservative nonprofit organization, more than 17.2 million people have concealed handgun permits in 2018, up more than 5 percent since 2017. It’s not just firearms that are illegal to carry through TSA; transporting ammunition in your carry-on is also prohibited. According to Guns & America’s analysis, 8,474 of the guns left in carry-ons found by TSA over the course of 2015-2017 were loaded. ATL, DFW and IAH are among the world’s busiest airports. ATL tops the list with 260 firearms found at TSA checkpoints in 2017. When you adjust the numbers to account for the number of passengers at each airport, however, the rankings show a different picture. TSA releases the raw numbers of guns its agents discover in baggage in weekly reports. Guns & America analyzed TSA data to compare the rate at which agents find guns at each airport. Among the 84 U.S. airports with more than 1 million passengers in 2017, Birmingham-Shuttlesworth International (BHM) in Alabama saw the highest rate of firearms found per passenger: 3.68 per 100,000 passengers. In Atlanta at ATL, that rate was 0.52 per 100,000 passengers. At DFW in Dallas, it was 0.55 per 100,000. 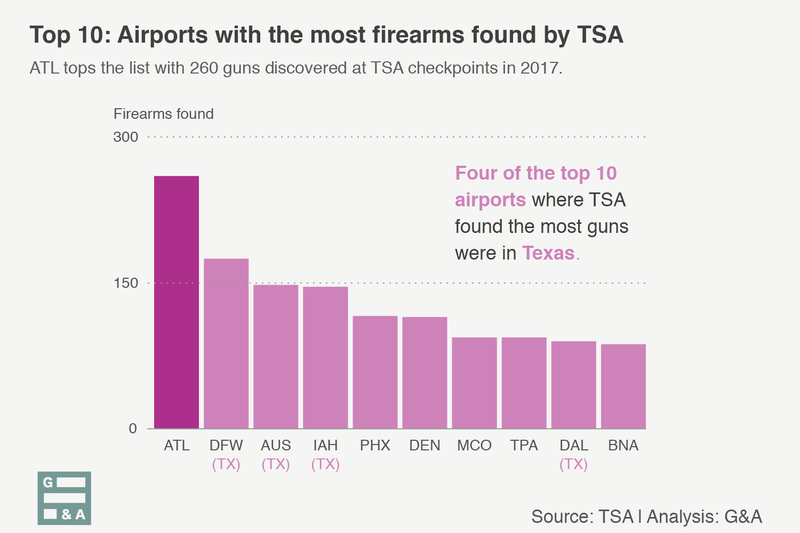 Like Birmingham, at smaller airports in cities such as Tulsa, Oklahoma City, Boise and Spokane, TSA agents discovered more guns per passenger than at the larger, busier airports. While passenger volume can impact the number of guns found, Guns & America’s analysis of TSA data found airports with high passenger volume in states with strict gun laws, like LAX in Los Angeles and New York’s JFK, saw a lower number of guns discovered in carry-ons in 2017. When comparing the number of firearms found with the number of passengers, BHM (Birmingham, AL) has the highest rate of firearms per 100,000 passengers boarded. 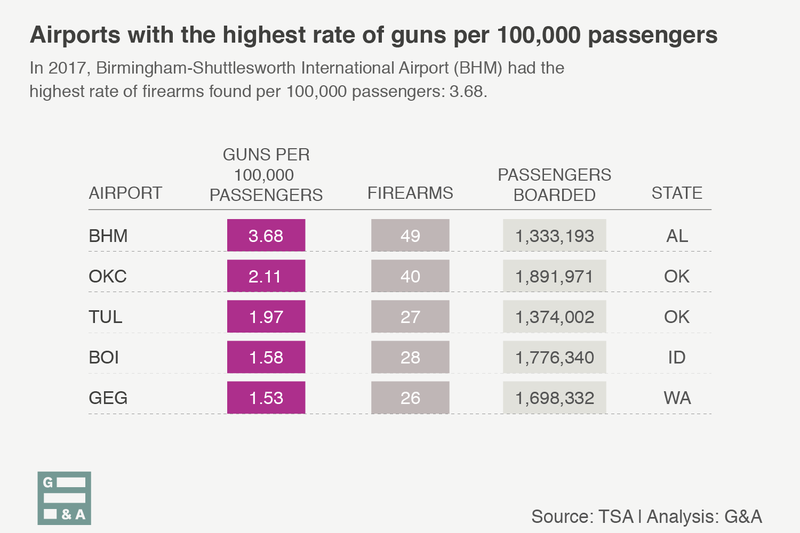 Birmingham-Shuttlesworth International Airport, Will Rogers World Airport, Tulsa International Airport, Boise Airport and Spokane International Airport had the highest rate of firearms found per 100,000 passengers in 2017. When a TSA agent finds a firearm in a carry-on, they contact airport police. Police then take possession of the weapon and determine whether or not there will be criminal charges. The TSA can then also levy a civil penalty, which can be as high as $13,300. At Dallas/Fort Worth International Airport, for instance, authorities perform a background check on the passenger. If the traveler passes a background check and has a License To Carry (LTC), they are able to take their gun back home or to their car. If they do not have an LTC, a case is usually filed with the local Criminal District Attorney’s Office, depending on the location of the checkpoint. 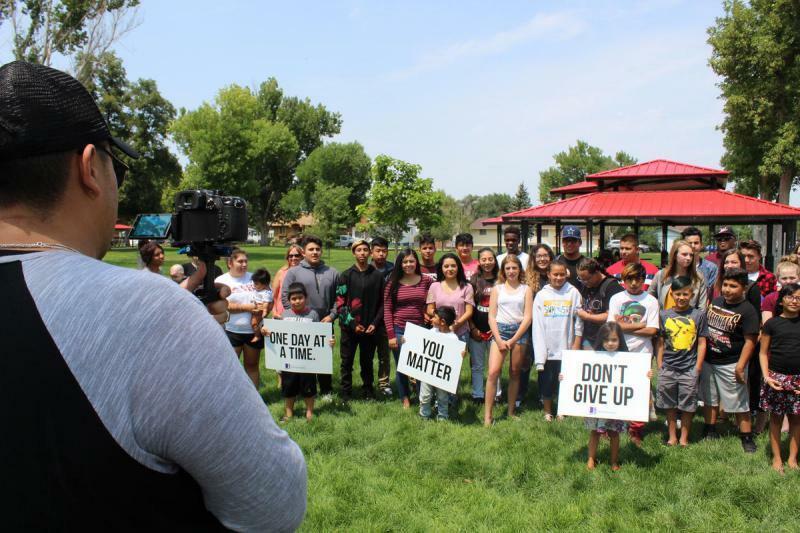 From there, the perceived intent of the gun owner determines whether the charge will be classified as a misdemeanor or a felony. “You would think everyone would know what’s in their luggage,” said Larry Moore, Criminal Division Chief in the Tarrant County District Attorney’s Office. Plus there’s the practical implication: Finding a gun slows down a TSA checkpoint, diverting passengers to other lanes. And that commotion, or lack thereof, could determine whether police issue a typical citation or arrest the passenger. 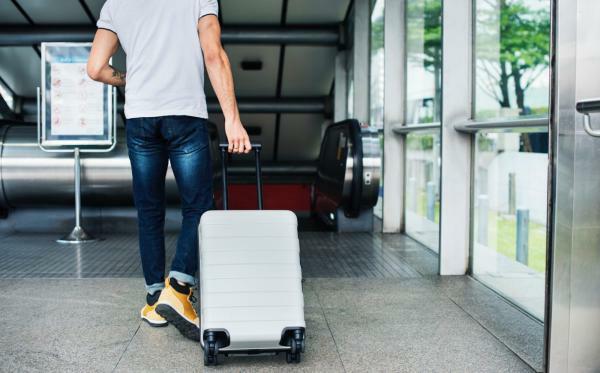 For those who want to travel with their gun, domestic U.S. airlines expect you to inform them, pack it in a hard case, unloaded and separate from ammunition in your checked bag. As the holiday travel season reaches a fever pitch, the TSA says to check your bag before you arrive, and always get to the airport early, regardless of whether or not you plan to travel with your gun. TSA publishes its data on firearms found in checkpoints as images (png files.) For gathering the data, Guns & America used a technique known as OCR, and manual data input. The TSA doesn’t update those images retroactively, so end of the year totals calculated by Guns & America may vary from final annual numbers reported by TSA. 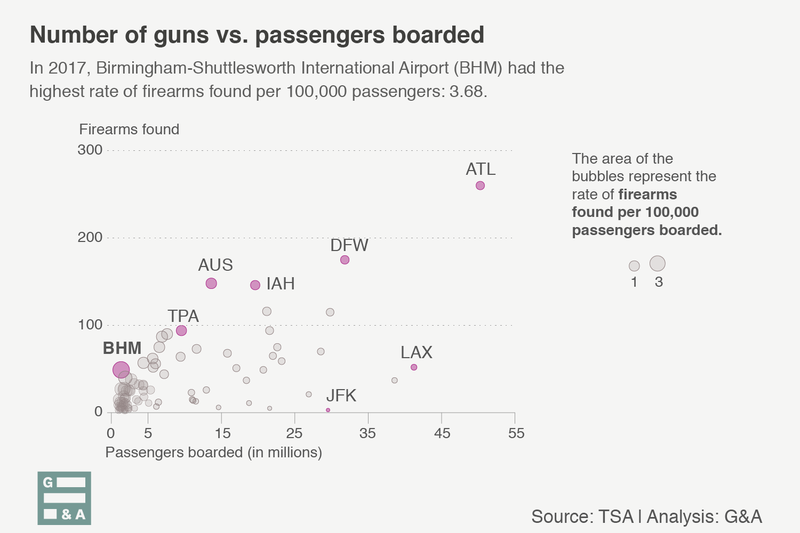 Guns & America used the Bureau of Transportation Statistics data for the number of passengers by airport as it compares to the number of firearms discovered. Only the the number of people who boarded a flight with origin in a U.S. airport were included to calculated the rate, as a proxy of people who crossed a TSA checkpoint. Francesca Slesinger and Jeremy Bernfeld contributed to this story. This year, high-profile incidents like the deaths of Anthony Bourdain and Kate Spade as well as clusters of suicides among young people in communities all over the country have served as a reminder that suicide is a growing public health issue in the U.S.
Last year’s Black Friday set the single-day record for gun background checks run — 203,086. 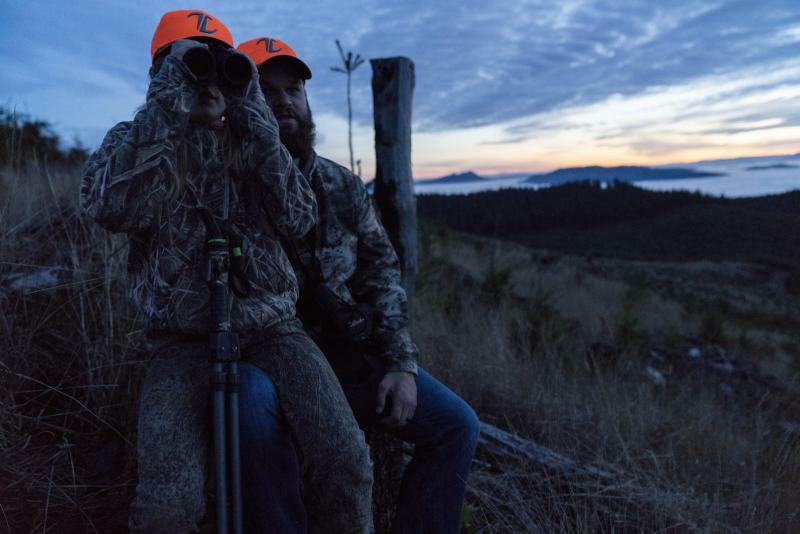 When you buy a gun from a federally licensed firearms dealer, they’re required to run a background check. While there is no tally of guns sold in the U.S., there is a daily count of background check requests from the FBI and it’s generally considered the best way to measure gun sales.